The exploration of Jupiter has been conducted via close observations by automated spacecraft. It began with the arrival of Pioneer 10 into the Jovian system in 1973, and, as of 2016[update], has continued with eight further spacecraft missions. All of these missions were undertaken by the National Aeronautics and Space Administration (NASA), and all but two have been flybys that take detailed observations without the probe landing or entering orbit. These probes make Jupiter the most visited of the Solar System's outer planets as all missions to the outer Solar System have used Jupiter flybys to reduce fuel requirements and travel time. On 5 July 2016, spacecraft Juno arrived and entered the planet's orbit—the second craft ever to do so. Sending a craft to Jupiter entails many technical difficulties, especially due to the probes' large fuel requirements and the effects of the planet's harsh radiation environment. The first spacecraft to visit Jupiter was Pioneer 10 in 1973, followed a year later by Pioneer 11. Aside from taking the first close-up pictures of the planet, the probes discovered its magnetosphere and its largely fluid interior. The Voyager 1 and Voyager 2 probes visited the planet in 1979, and studied its moons and the ring system, discovering the volcanic activity of Io and the presence of water ice on the surface of Europa. Ulysses further studied Jupiter's magnetosphere in 1992 and then again in 2000. The Cassini probe approached the planet in 2000 and took very detailed images of its atmosphere. The New Horizons spacecraft passed by Jupiter in 2007 and made improved measurements of its and its satellites' parameters. The Galileo spacecraft was the first to have entered orbit around Jupiter, arriving in 1995 and studying the planet until 2003. During this period Galileo gathered a large amount of information about the Jovian system, making close approaches to all of the four large Galilean moons and finding evidence for thin atmospheres on three of them, as well as the possibility of liquid water beneath their surfaces. It also discovered a magnetic field around Ganymede. As it approached Jupiter, it also witnessed the impact of Comet Shoemaker–Levy 9. In December 1995, it sent an atmospheric probe into the Jovian atmosphere, so far the only craft to do so. In July 2016, the Juno spacecraft, launched in 2011, completed its orbital insertion maneuver successfully, and is now in orbit around Jupiter with its science programme ongoing. The European Space Agency selected the L1-class JUICE mission in 2012 as part of its Cosmic Vision programme to explore three of Jupiter's Galilean moons, with a possible Ganymede lander provided by Roscosmos. JUICE is proposed to be launched in 2022. ISRO will launch the first Indian mission to Jupiter in 2022 or 2023 through Geosynchronous Satellite Launch Vehicle Mark III. Flights from Earth to other planets in the Solar System have a high energy cost. It requires almost the same amount of energy for a spacecraft to reach Jupiter from Earth's orbit as it does to lift it into orbit in the first place. In astrodynamics, this energy expenditure is defined by the net change in the spacecraft's velocity, or delta-v. The energy needed to reach Jupiter from an Earth orbit requires a delta-v of about 9 km/s, compared to the 9.0–9.5 km/s to reach a low Earth orbit from the ground. Gravity assists through planetary flybys (such as by Earth or Venus) can be used to reduce the energetic requirement (i.e. the fuel) at launch, at the cost of a significantly longer flight duration to reach a target such as Jupiter when compared to the direct trajectory. Ion thrusters capable of a delta-v of more than 10 kilometers/s were used on the Dawn spacecraft. This is more than enough delta-v to do a Jupiter fly-by mission from a solar orbit of the same radius as that of Earth without gravity assist. A major problem in sending space probes to Jupiter is that the planet has no solid surface on which to land, as there is a smooth transition between the planet's atmosphere and its fluid interior. Any probes descending into the atmosphere are eventually crushed by the immense pressures within Jupiter. Another major issue is the amount of radiation to which a space probe is subjected, due to the harsh charged-particle environment around Jupiter (for a detailed explanation see Magnetosphere of Jupiter). For example, when Pioneer 11 made its closest approach to the planet, the level of radiation was ten times more powerful than Pioneer's designers had predicted, leading to fears that the probes would not survive. With a few minor glitches, the probe managed to pass through the radiation belts, but it lost most of the images of the moon Io, as the radiation had caused Pioneer's imaging photo polarimeter to receive false commands. The subsequent and far more technologically advanced Voyager spacecraft had to be redesigned to cope with the radiation levels. Over the eight years the Galileo spacecraft orbited the planet, the probe's radiation dose far exceeded its design specifications, and its systems failed on several occasions. The spacecraft's gyroscopes often exhibited increased errors, and electrical arcs sometimes occurred between its rotating and non-rotating parts, causing it to enter safe mode, which led to total loss of the data from the 16th, 18th and 33rd orbits. The radiation also caused phase shifts in Galileo's ultra-stable quartz oscillator. The first spacecraft to explore Jupiter was Pioneer 10, which flew past the planet in December 1973, followed by Pioneer 11 twelve months later. Pioneer 10 obtained the first-ever close-up images of Jupiter and its Galilean moons; the spacecraft studied the planet's atmosphere, detected its magnetic field, observed its radiation belts and determined that Jupiter is mainly fluid. Pioneer 11 made its closest approach, within some 34,000 km of Jupiter's cloud tops, on December 4, 1974. It obtained dramatic images of the Great Red Spot, made the first observation of Jupiter's immense polar regions, and determined the mass of Jupiter's moon Callisto. The information gathered by these two spacecraft helped astronomers and engineers improve the design of future probes to cope more effectively with the environment around the giant planet. Voyager 1 began photographing Jupiter in January 1979 and made its closest approach on March 5, 1979, at a distance of 349,000 km from Jupiter's center. This close approach allowed for greater image resolution, though the flyby's short duration meant that most observations of Jupiter's moons, rings, magnetic field, and radiation environment were made in the 48-hour period bracketing the approach, even though Voyager 1 continued photographing the planet until April. It was soon followed by Voyager 2, which made its closest approach on July 9, 1979, 576,000 km away from the planet's cloud tops. The probe discovered Jupiter's ring, observed intricate vortices in its atmosphere, observed active volcanoes on Io, a process analogous to plate tectonics on Ganymede, and numerous craters on Callisto. The Voyager missions vastly improved our understanding of the Galilean moons, and also discovered Jupiter's rings. They also took the first close-up images of the planet's atmosphere, revealing the Great Red Spot as a complex storm moving in a counter-clockwise direction. Other smaller storms and eddies were found throughout the banded clouds (see animation on the right). Two new, small satellites, Adrastea and Metis, were discovered orbiting just outside the ring, making them the first of Jupiter's moons to be identified by a spacecraft. A third new satellite, Thebe, was discovered between the orbits of Amalthea and Io. The discovery of volcanic activity on the moon Io was the greatest unexpected finding of the mission, as it was the first time an active volcano was observed on a celestial body other than Earth. Together, the Voyagers recorded the eruption of nine volcanoes on Io, as well as evidence for other eruptions occurring between the Voyager encounters. Europa displayed a large number of intersecting linear features in the low-resolution photos from Voyager 1. At first, scientists believed the features might be deep cracks, caused by crustal rifting or tectonic processes. The high-resolution photos from Voyager 2, taken closer to Jupiter, left scientists puzzled as the features in these photos were almost entirely lacking in topographic relief. This led many to suggest that these cracks might be similar to ice floes on Earth, and that Europa might have a liquid water interior. Europa may be internally active due to tidal heating at a level about one-tenth that of Io, and as a result, the moon is thought to have a thin crust less than 30 kilometers (19 mi) thick of water ice, possibly floating on a 50-kilometers-deep (30 mile) ocean. On February 8, 1992, the Ulysses solar probe flew past Jupiter's north pole at a distance of 451,000 km. This swing-by maneuver was required for Ulysses to attain a very high-inclination orbit around the Sun, increasing its inclination to the ecliptic to 80.2 degrees. The giant planet's gravity bent the spacecraft's flightpath downward and away from the ecliptic plane, placing it into a final orbit around the Sun's north and south poles. The size and shape of the probe's orbit were adjusted to a much smaller degree, so that its aphelion remained at approximately 5 AU (Jupiter's distance from the Sun), while its perihelion lay somewhat beyond 1 AU (Earth's distance from the Sun). During its Jupiter encounter, the probe made measurements of the planet's magnetosphere. Since the probe had no cameras, no images were taken. In February 2004, the probe arrived again at the vicinity of Jupiter. This time the distance from the planet was much greater—about 120 million km (0.8 AU)—but it made further observations of Jupiter. In 2000, the Cassini probe, en route to Saturn, flew by Jupiter and provided some of the highest-resolution images ever taken of the planet. It made its closest approach on December 30, 2000, and made many scientific measurements. About 26,000 images of Jupiter were taken during the months-long flyby. It produced the most detailed global color portrait of Jupiter yet, in which the smallest visible features are approximately 60 km (37 mi) across. A major finding of the flyby, announced on March 5, 2003, was of Jupiter's atmospheric circulation. Dark belts alternate with light zones in the atmosphere, and the zones, with their pale clouds, had previously been considered by scientists to be areas of upwelling air, partly because on Earth clouds tend to be formed by rising air. Analysis of Cassini imagery showed that the dark belts contain individual storm cells of upwelling bright-white clouds, too small to see from Earth. Anthony Del Genio of NASA's Goddard Institute for Space Studies said that "the belts must be the areas of net-rising atmospheric motion on Jupiter, [so] the net motion in the zones has to be sinking". Other atmospheric observations included a swirling dark oval of high atmospheric-haze, about the size of the Great Red Spot, near Jupiter's north pole. Infrared imagery revealed aspects of circulation near the poles, with bands of globe-encircling winds, and adjacent bands moving in opposite directions. The same announcement also discussed the nature of Jupiter's rings. Light scattering by particles in the rings showed the particles were irregularly shaped (rather than spherical) and likely originated as ejecta from micrometeorite impacts on Jupiter's moons, probably on Metis and Adrastea. On December 19, 2000, the Cassini spacecraft captured a very-low-resolution image of the moon Himalia, but it was too distant to show any surface details. The New Horizons probe, en route to Pluto, flew by Jupiter for a gravity assist and was the first probe launched directly towards Jupiter since the Ulysses in 1990. Its Long Range Reconnaissance Imager (LORRI) took its first photographs of Jupiter on September 4, 2006. The spacecraft began further study of the Jovian system in December 2006, and made its closest approach on February 28, 2007. Although close to Jupiter, New Horizons' instruments made refined measurements of the orbits of Jupiter's inner moons, particularly Amalthea. The probe's cameras measured volcanoes on Io, studied all four Galilean moons in detail, and made long-distance studies of the outer moons Himalia and Elara. The craft also studied Jupiter's Little Red Spot and the planet's magnetosphere and tenuous ring system. On March 19, 2007 the Command and Data Handling computer experienced an uncorrectable memory error and rebooted itself, causing the spacecraft to go into safe mode. The craft fully recovered within two days, with some data loss on Jupiter's magnetotail. No other data loss events were associated with the encounter. Due to the immense size of the Jupiter system and the relative closeness of the Jovian system to Earth in comparison to the closeness of Pluto to Earth, New Horizons sent back more data to Earth from the Jupiter encounter than the Pluto encounter. The first spacecraft to orbit Jupiter was the Galileo orbiter, which went into orbit around Jupiter on December 7, 1995. It orbited the planet for over seven years, making 35 orbits before it was destroyed during a controlled impact with Jupiter on September 21, 2003. During this period, it gathered a large amount of information about the Jovian system; the amount of information was not as great as intended because the deployment of its high-gain radio transmitting antenna failed. The major events during the eight-year study included multiple flybys of all of the Galilean moons, as well as Amalthea (the first probe to do so). It also witnessed the impact of Comet Shoemaker–Levy 9 as it approached Jupiter in 1994 and the sending of an atmospheric probe into the Jovian atmosphere in December 1995. Cameras on the Galileo spacecraft observed fragments of Comet Shoemaker–Levy 9 between 16 and 22 July 1994 as they collided with Jupiter's southern hemisphere at a speed of approximately 60 kilometres per second. This was the first direct observation of an extraterrestrial collision of solar system objects. While the impacts took place on the side of Jupiter hidden from Earth, Galileo, then at a distance of 1.6 AU from the planet, was able to see the impacts as they occurred. Its instruments detected a fireball that reached a peak temperature of about 24,000 K, compared to the typical Jovian cloudtop temperature of about 130 K (−143 °C), with the plume from the fireball reaching a height of over 3,000 km. An atmospheric probe was released from the spacecraft in July 1995, entering the planet's atmosphere on December 7, 1995. After a high-g descent into the Jovian atmosphere, the probe discarded the remains of its heat shield, and it parachuted through 150 km of the atmosphere, collecting data for 57.6 minutes, before being crushed by the pressure and temperature to which it was subjected (about 22 times Earth normal, at a temperature of 153 °C). It would have melted thereafter, and possibly vaporized. The Galileo orbiter itself experienced a more rapid version of the same fate when it was deliberately steered into the planet on September 21, 2003 at a speed of over 50 km/s, in order to avoid any possibility of it crashing into and contaminating Europa. identification of the global structure and dynamics of a giant planet's magnetosphere. NASA launched Juno on August 5, 2011 to study Jupiter in detail. It entered a polar orbit of Jupiter on July 5, 2016. The spacecraft is studying the planet's composition, gravity field, magnetic field, and polar magnetosphere. Juno is also searching for clues about how Jupiter formed, including whether the planet has a rocky core, the amount of water present within the deep atmosphere, and how the mass is distributed within the planet. Juno also studies Jupiter's deep winds, which can reach speeds of 600 km/h. 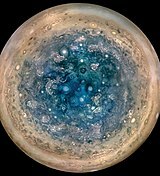 ESA's Jupiter Icy Moon Explorer (JUICE) has been selected as part of ESA's Cosmic Vision science program. It is expected to launch in 2022 and, after a series of flybys in the inner Solar System, arrive in 2030. In 2012, the European Space Agency's selected the JUpiter ICy moon Explorer (JUICE) as its first Large mission, replacing its contribution to EJSM, the Jupiter Ganymede Orbiter (JGO). The partnership for the Europa Jupiter System Mission has since ended, but NASA will continue to contribute the European mission with hardware and an instrument. The Europa Clipper is a mission proposed to NASA to focus on studying Jupiter's moon Europa. In March 2013, funds were authorized for "pre-formulation and/or formulation activities for a mission that meets the science goals outlined for the Jupiter Europa mission in the most recent planetary decadal survey". The proposed mission would be set to launch in the early 2020s and reach Europa after a 6.5 year cruise. The spacecraft would fly by the moon 32 times to minimize radiation damage. Because of the possibility of subsurface liquid oceans on Jupiter's moons Europa, Ganymede and Callisto, there has been great interest in studying the icy moons in detail. Funding difficulties have delayed progress. The Europa Orbiter was a planned NASA mission to Europa, which was canceled in 2002. Its main objectives included determining the presence or absence of a subsurface ocean and identifying candidate sites for future lander missions. NASA's JIMO (Jupiter Icy Moons Orbiter), which was canceled in 2005, and a European Jovian Europa Orbiter mission were also studied, but were superseded by the Europa Jupiter System Mission. The Europa Jupiter System Mission (EJSM) was a joint NASA/ESA proposal for exploration of Jupiter and its moons. In February 2009 it was announced that both space agencies had given this mission priority ahead of the Titan Saturn System Mission. The proposal included a launch date of around 2020 and consists of the NASA-led Jupiter Europa Orbiter, and the ESA-led Jupiter Ganymede Orbiter. ESA's contribution had encountered funding competition from other ESA projects. However, the Jupiter Europa Orbiter (JEO), NASA's contribution, was considered by the Planetary Decadal Survey to be too expensive. The survey supported a cheaper alternative to JEO. While scientists require further evidence to determine the extent of a rocky core on Jupiter, its Galilean moons provide the potential opportunity for future human exploration. Particular targets are Europa, due to its potential for life, and Callisto, due to its relatively low radiation dose. In 2003, NASA proposed a program called Human Outer Planets Exploration (HOPE) that involved sending astronauts to explore the Galilean moons. NASA has projected a possible attempt some time in the 2040s. In the Vision for Space Exploration policy announced in January 2004, NASA discussed missions beyond Mars, mentioning that a "human research presence" may be desirable on Jupiter's moons. Before the JIMO mission was cancelled, NASA administrator Sean O'Keefe stated that "human explorers will follow." NASA has speculated on the feasibility of mining the atmospheres of the outer planets, particularly for helium-3, an isotope of helium that is rare on Earth and could have a very high value per unit mass as thermonuclear fuel. Factories stationed in orbit could mine the gas and deliver it to visiting craft. However, the Jovian system in general poses particular disadvantages for colonization because of the severe radiation conditions prevailing in Jupiter's magnetosphere and the planet's particularly deep gravitational well. Jupiter would deliver about 36 Sv (3600 rem) per day to unshielded colonists at Io and about 5.4 Sv (540 rems) per day to unshielded colonists at Europa, which is a decisive aspect due to the fact that already an exposure to about 0.75 Sv over a period of a few days is enough to cause radiation poisoning, and about 5 Sv over a few days is fatal. Ganymede is the Solar System's largest moon and the Solar System's only known moon with a magnetosphere, but this does not shield it from cosmic radiation to a noteworthy degree, because it is overshadowed by Jupiter's magnetic field. Ganymede receives about 0.08 Sv (8 rem) of radiation per day. Callisto is farther from Jupiter's strong radiation belt and subject to only 0.0001 Sv (0.01 rem) a day. For comparison, the average amount of radiation taken on Earth by a living organism is about 0.0024 Sv per year; the highest natural radiation levels on Earth are recorded around Ramsar hot springs at about 0.26 Sv per year. One of the main targets chosen by the HOPE study was Callisto. The possibility of building a surface base on Callisto was proposed, because of the low radiation levels at its distance from Jupiter and its geological stability. Callisto is the only Galilean satellite for which human exploration is feasible. The levels of ionizing radiation on Io, Europa, and Ganymede are hostile to human life, and adequate protective measures have yet to be devised. It could be possible to build a surface base that would produce fuel for further exploration of the Solar System. In 1997, the Artemis Project designed a plan to colonize Europa. According to this plan, explorers would drill down into the Europan ice crust, entering the postulated subsurface ocean, where they would inhabit artificial air pockets. ^ "JUICE is Europe's next large science mission". European Space Agency. 2 May 2012. Retrieved 21 April 2015. ^ "JUICE mission gets green light for next stage of development". European Space Agency. 27 November 2014. Retrieved 21 April 2015. ^ "International Colloquium and Workshop—"Ganymede Lander: scientific goals and experiments"". Russia Space Research Institute (IKI). Roscosmos. November 2012. Retrieved 2012-11-20. ^ Wong, Al (May 28, 1998). "Galileo FAQ – Navigation". NASA. Retrieved November 28, 2006. ^ Guillot, Tristan (1999). "A comparison of the interiors of Jupiter and Saturn". Planetary and Space Science. 47 (10–11): 1183–1200. arXiv:astro-ph/9907402. Bibcode:1999P&SS...47.1183G. doi:10.1016/S0032-0633(99)00043-4. ^ Wolverton, Mark (2004). The Depths of Space. Joseph Henry Press. p. 130. ISBN 978-0-309-09050-6. ^ a b "The Pioneer missions". NASA. 2007. Retrieved June 28, 2009. ^ Fieseler, P.D. ; Ardalan, S.M. ; Frederickson, A.R. (2002). "The radiation effects on Galileo spacecraft systems at Jupiter". IEEE Transactions on Nuclear Science. 49 (6): 2739. Bibcode:2002ITNS...49.2739F. doi:10.1109/TNS.2002.805386. ^ Chang, Kenneth (May 25, 2017). "NASA's Jupiter Mission Reveals the 'Brand-New and Unexpected'". The New York Times. Retrieved May 27, 2017. ^ Andrew P. Ingersoll; Carolyn C. Porco (July 1978). "Solar heating and internal heat flow on Jupiter". Icarus. 35 (1): 27–43. Bibcode:1978Icar...35...27I. doi:10.1016/0019-1035(78)90058-1. ^ Michael Mewhinney (2003). "Pioneer spacecraft sends last signal". NASA. Retrieved June 28, 2009. ^ "Pioneer 11". NASA. Archived from the original on June 19, 2010. Retrieved June 28, 2009. ^ a b "Jupiter". NASA Jet Propulsion Laboratory. January 14, 2003. Retrieved November 28, 2006. ^ "First Close-up Image of Jupiter from Voyager 1 (NASA Voyager Jupiter Encounter Images)". Ciclops.org. Retrieved May 20, 2009. ^ E. C. Stone; A. L. Lane (October 5, 1979). "Voyager 2 Encounter with the Jovian System". Science. 206 (4421): 925–927. Bibcode:1979Sci...206..925S. doi:10.1126/science.206.4421.925. PMID 17733909. ^ Synnott, S.P. (1981). "1979J3: Discovery of a Previously Unknown Satellite of Jupiter". Science. 212 (4501): 1392. Bibcode:1981Sci...212.1392S. doi:10.1126/science.212.4501.1392. ISSN 0036-8075. JSTOR 1686790. PMID 17746259. ^ Burns, J.A. ; Simonelli; Showalter; Hamilton; Porco; Throop; Esposito (2004). "Jupiter's Ring-Moon System" (PDF). In Bagenal, F.; Dowling, T.E. ; McKinnon, W.B. Jupiter: The Planet, Satellites and Magnetosphere. p. 241. Bibcode:2004jpsm.book..241B. ^ Strom, R. G.; et al. (1979). "Volcanic eruption plumes on Io". Nature. 280 (5725): 733–736. Bibcode:1979Natur.280..733S. doi:10.1038/280733a0. ^ Paul M. Schenk; William B. McKinnon (May 1989). "Fault offsets and lateral crustal movement on Europa: Evidence for a mobile ice shell". Icarus. 79 (1): 75–100. Bibcode:1989Icar...79...75S. doi:10.1016/0019-1035(89)90109-7. ^ Buratti, B; Veverka, Joseph (1983). "Voyager photometry of Europa". Icarus. 55 (1): 93. Bibcode:1983Icar...55...93B. doi:10.1016/0019-1035(83)90053-2. ^ a b c K. Chan; E. S. Paredes; M. S. Ryne (2004). "Ulysses Attitude and Orbit Operations: 13+ Years of International Cooperation" (PDF). American Institute of Aeronautics and Astronautics. Archived from the original (PDF) on December 14, 2005. Retrieved November 28, 2006. ^ Mckibben, R; Zhang, M; Heber, B; Kunow, H; Sanderson, T (2007). "Localized "Jets" of Jovian electrons observed during Ulysses' distant Jupiter flyby in 2003–2004". Planetary and Space Science. 55 (1–2): 21–31. Bibcode:2007P&SS...55...21M. doi:10.1016/j.pss.2006.01.007. ^ "Ulysses – Science – Jupiter Distant Encounter Selected References". NNASA. Archived from the original on September 23, 2008. Retrieved October 21, 2008. ^ "Cassini-Huygens: News-Press Releases-2003". NASA. Archived from the original on November 21, 2007. Retrieved October 21, 2008. ^ "Jupiter, Ahoy!". New Horizons Web Site. Johns Hopkins University. Archived from the original on March 9, 2011. Retrieved November 2, 2008. ^ Stern, S. Alan (2008). "The New Horizons Pluto Kuiper Belt Mission: An Overview with Historical Context". Space Science Reviews. 140 (1–4): 3–21. arXiv:0709.4417. Bibcode:2008SSRv..140....3S. doi:10.1007/s11214-007-9295-y. ^ "NASA Spacecraft Gets Boost From Jupiter for Pluto Encounter". The America's Intelligence Wire. February 28, 2007. Archived from the original on July 5, 2009. Retrieved March 23, 2014. ^ Cheng, A. F.; Weaver, H. A.; Conard, S. J.; Morgan, M. F.; Barnouin-Jha, O.; Boldt, J. D.; Cooper, K. A.; Darlington, E. H.; et al. (2008). "Long-Range Reconnaissance Imager on New Horizons". Space Science Reviews. 140 (1–4): 189–215. arXiv:0709.4278. Bibcode:2008SSRv..140..189C. doi:10.1007/s11214-007-9271-6. ^ "Fantastic Flyby". NASA. May 1, 2007. Archived from the original on July 25, 2009. Retrieved July 2, 2009. ^ "Galileo Mission to Jupiter" (PDF). NASA/Jet Propulsion Laboratory. Retrieved July 9, 2009. ^ a b McConnell, Shannon (April 14, 2003). "Galileo: Journey to Jupiter". NASA/Jet Propulsion Laboratory. Retrieved November 28, 2006. ^ Williams, David R. "Ulysses and Voyager 2". Lunar and Planetary Science. National Space Science Data Center. Retrieved August 25, 2008. ^ "Comet Shoemaker–Levy 9 Collision with Jupiter". National Space Science Date Center, NASA. February 2005. Archived from the original on February 25, 2013. Retrieved August 26, 2008. ^ Martin, Terry Z. (September 1996). "Shoemaker–Levy 9: Temperature, Diameter and Energy of Fireballs". Bulletin of the American Astronomical Society. 28: 1085. Bibcode:1996DPS....28.0814M. ^ "Galileo Mission to Jupiter" (PDF). NASA. Retrieved November 1, 2008. ^ "BBC News | SCI/TECH | Crash plan for Galileo spaceprobe". 212.58.226.17:8080. March 3, 2000. Archived from the original on July 5, 2009. Retrieved May 20, 2009. ^ Rosaly M. C. Lopes; John R. Spencer. (2007). Io after Galileo : a new view of Jupiter's volcanic moon. Berlin: Springer. ISBN 978-3-540-34681-4. ^ P. Bond. (2004). Stepping stones to the cosmos : the story of planetary exploration. New York ; Berlin: Springer. pp. 166–182. ISBN 978-0-387-40212-3. ^ "Galileo Project Information". Nssdc.gsfc.nasa.gov. Retrieved May 24, 2009. ^ "Solar System Exploration: Galileo Legacy Site: Discovery Highlights". Solarsystem.nasa.gov. August 9, 2007. Retrieved May 24, 2009. ^ Daniel Fischer. (1999). Mission Jupiter : the spectacular journey of the Galileo spacecraft. New York: Copernicus. ISBN 978-0-387-98764-4. ^ a b Cook, Jia-Rui c. (December 11, 2013). "Clay-Like Minerals Found on Icy Crust of Europa". NASA. Retrieved December 11, 2013. ^ "Juno – NASA's Second New Frontiers Mission to Jupiter". Retrieved October 24, 2007. ^ Buckley, M. (May 20, 2008). "Storm Winds Blow in Jupiter's Little Red Spot". Johns Hopkins Applied Physics Laboratory. Archived from the original on March 26, 2012. Retrieved October 16, 2008. ^ Steigerwald , Bill (October 10, 2006). "Jupiter's Little Red Spot Growing Stronger". NASA Goddard Space Center. Retrieved October 16, 2008. ^ Amos, Jonathan (May 2, 2012). "Esa selects 1bn-euro Juice probe to Jupiter". BBC News Online. Retrieved December 14, 2013. ^ "NASA and JPL Contribute to European Jupiter Mission". JPL. February 21, 2013. Retrieved December 14, 2013. ^ a b "Europa Clipper". Jet Propulsion Laboratory. NASA. November 2013. Retrieved December 14, 2013. ^ "Destination: Europa". Europa SETI. March 29, 2013. Archived from the original on August 23, 2014. Retrieved December 14, 2013. ^ "The Europa Orbiter Mission Design". Hdl.handle.net. Archived from the original on February 23, 2012. Retrieved May 20, 2009. ^ "NASA Kills Europa Orbiter". Space.com. February 4, 2002. Retrieved May 20, 2009. ^ Atzei, Alessandro (April 27, 2007). "Jovian Minisat Explorer". ESA. Retrieved May 8, 2008. ^ Talevi, Monica; Brown, Dwayne (February 18, 2009). "NASA and ESA Prioritize Outer Planet Missions". Retrieved February 18, 2009. ^ Rincon, Paul (February 18, 2009). "Jupiter in space agencies' sights". BBC News. Retrieved February 28, 2009. ^ Tim Brice. "Outer Planet Flagship Mission: Jupiter Ganymede Orbiter (JGO) Concept". Opfm.jpl.nasa.gov. Archived from the original on February 17, 2012. Retrieved May 24, 2009. ^ OPF Study Team (August 28, 2008). "Outer Planet Flagship Mission: Briefing to the OPAG Steering Committee" (PDF). Outer Planets Assessment Group. Retrieved October 14, 2008. ^ Volonte, Sergio (July 10, 2007). "Cosmic Vision 2015–2025 Proposals". ESA. Retrieved February 18, 2009. ^ Pat Troutman; Kristen Bethke (2003). "Revolutionary Concepts for Human Outer Planet Exploration" (PDF). NASA. Archived from the original (PDF) on January 19, 2012. Retrieved July 2, 2009. ^ Melissa L. McGuire; James Gilland (2003). "High Power MPD Nuclear Electric Propulsion (NEP) for Artificial Gravity HOPE Missions to Callisto" (PDF). NASA. Retrieved June 30, 2009. ^ "Vision for Space Exploration" (PDF). NASA. 2003. Retrieved July 2, 2009. ^ "NASA plans to send new robot to Jupiter". SpaceDaily. 2004. Retrieved June 30, 2009. ^ Bryan Palaszewski (October 2006). "Atmospheric Mining in the Outer Solar System" (PDF). Glenn Research Center. Archived from the original (PDF) on March 27, 2009. Retrieved July 2, 2009. ^ a b c d e f g h Frederick A. Ringwald (February 28, 2000). "SPS 1020 (Introduction to Space Sciences)". California State University, Fresno. Archived from the original on September 20, 2009. Retrieved July 4, 2009. ^ Robert Zubrin, Entering Space: Creating a Spacefaring Civilization, section: Colonizing the Jovian System, pp. 166–170, Tarcher/Putnam, 1999, ISBN 1-58542-036-0. ^ "Humans on Europa: A Plan for Colonies on the Icy Moon". Space.com. June 6, 2001. Retrieved May 10, 2006. This page was last edited on 17 April 2019, at 19:53 (UTC).